Judgments! How do they affect you? What can you do to get rid of them? How much do they really cost you? You owe a creditor some money. You can't pay! You just don't have the cash and there is nothing left in your budget. You tell the creditors, but they just want their money! This is how it usually starts out. You have every intention of paying your bills, but you just can't for one reason, or another. The creditor decides to take its debt collection process a step further and starts a lawsuit against you. In most cases, there is nothing to defend. You know you owe the money. The bottom line: the creditor gets a judgment against you. In North Carolina, the entry of a judgment against you can cause a creditor to put a lien on all real property you have in the County where the judgment is recorded with the county recorder as well as on all non exempt property.. The judgment lien is like having a creditor get an additional mortgage against your property. Worse, assuming there is some value in your real property above the mortgages, the creditor may well be able to put your real property up for sale at public auction. This would be a tough way to lose your home. The Creditor is awarded the judgment for whatever amount of money is owed, plus in many cases attorney fees and costs. Lets say it's $2,000.00 as an example. What does this mean? Well! First, it means that the Creditor can take the money out of your checking account, if he can find your bank account. Here's an example. You have just put your paycheck in your checking account. It was $800.00. Let's say the creditor knows where you bank and has already requested that the bank collect any money that gets deposited into your accounts. In this example, it would be $2,000. The $800 would be gone! If you have any money in a savings account, it will also be gone. The judgment also goes on your credit report and in most cases that means no more credit. It also has some negative effects when you're working a job with a security clearance. It's embarrassing! It's also something that can be taken care of using Federal Bankruptcy Laws! You can stop these negative effects of judgments fast! If need be, in the case of a "non-dischargeable" debt, and using Chapter 13, you can claim the right to pay it, up to 60 months in most cases. Over 60 months, your payment on this debt would be less than $10 per week. That assumes you have to pay it at all. Many judgments especially with respect to unsecured debts never have to be paid back. It just depends on the facts of your particular situation. Every thing you think is hopeless has a solution if you ask the right attorney! 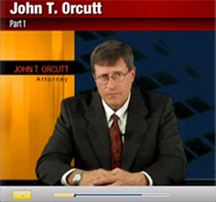 The Law Offices of Law Offices of John T. Orcutt can give you straight answers to tough questions. They can also start the process to take that monkey off your back on the first visit! Make the call now! Call for a FREE Confidential Visit at: 1-888-234-4181. Stop getting pushed around, feeling angry and losing sleep!